"I have something called NMIndexStoreSvr.exe on my computer that routinely uses at least 50% of my CPU and at least 30% of my PC's Memory. I don't remember seeing this until recently. Do I need NMIndexStoreSvr.exe? Is NMIndexStoreSvr.exe a virus?" Fortunately, NMIndexStoreSvr.exe is not a virus. It's part of the Nero Scout utility included as part of all versions of Nero Ultra Edition from 7 on. Nero Scout scans your computer for media files and adds them to a catalog, in theory making it easier for you to use them with Nero later. Unfortunately, the folks at Nero didn't do the one thing other similar indexing services do right - only run the indexing service when your computer is idle. This really gets in the way when you are trying to do any other computing task that needs system resources. I personally haven't found a use for the Nero Scout service and turned it off rather than hassling with it running in the background on a regular basis, because I have other tools that effectively index files on my computer. Turning the process off is relatively simple. Launch Nero Scout by click Start > All Programs > Nero 7 (or 8) Ultra Edition > Tools > Nero Scout. 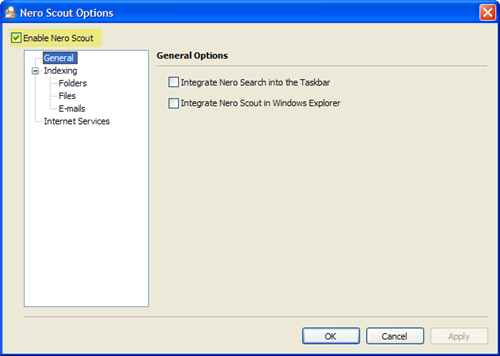 Uncheck the box next to Enable Nero Scout. Click OK.
You may have to reboot your computer to completely turn this off.